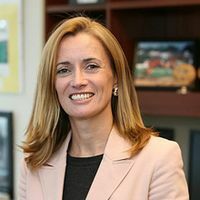 Blythe Masters is the former CEO of Digital Asset Holdings, a start-up providing settlement and ledger services (similar to blockchain, Bitcoin’s underlying technology) for both digital and mainstream financial transactions. To read the full article on Blythe Masters, click on to open a new tab with MarketsWiki. Though she is not considered a proponent of cryptocurrency, the fintech innovation that led to the creation of the first blockchain, Blythe Masters has been a prominent supporter of blockchain technology since 2015. She is known for her belief that financial institutions like banks can benefit from blockchain technology by integrating it into existing digital frameworks, cutting costs by eliminating the need for middlemen like clearing houses and other back office financial entities. Masters believes this can be accomplished without cryptocurrency. In July 2018, Digital Asset Holdings announced it had partnered with Google Cloud to provide blockchain developers with tools that would make it easier for them to create blockchain applications without having to code them from scratch. In December 2018, Digital Asset Holdings LLC announced Masters would be stepping down as CEO of the company for personal reasons. The company said she would remain a board member, strategic advisor and shareholder. Blythe Masters joined Digital Asset Holdings as CEO in March 2015. She is also a banker and one of the creators of credit default swaps. She is the former head of global commodities at JPMorgan Chase & Co., a position she was named to in 2007 and left in 2014 after the commodities unit was acquired by Mercuria. ↑ Swaps Pioneer Blythe Masters to Lead Virtual Currency Startup. Bloomberg. ↑ Blythe Masters and the End of a Blockchain Era. Bloomberg. ↑ Google Cloud Inks Deal With Blythe Masters' Blockchain Startup. Coindesk. ↑ CEO of Blockchain Startup Digital Asset Steps Down in Surprise Departure. Bloomberg. ↑ Blythe Masters steps down as CEO of blockchain startup Digital Asset. CNBC. ↑ Does the LSE Want Another Star CEO in Blythe Masters? : Gadfly. The Washington Post. ↑ JPMorgan sells physical commodities unit to Mercuria for $3.5 billion. Reuters. ↑ Blythe Masters to Leave JPMorgan. New York Times. This page was last edited on 19 December 2018, at 16:00.